This is an amazing Kings&Queens summer – great conferences, books, discussions, and now some prizes for outstanding scholarship in the field of Royal Studies! At the Kings&Queens conference, we celebrated with Joanna Laynesmith who won the CCCU Book Prize for her study on Cecily Duchess of York! 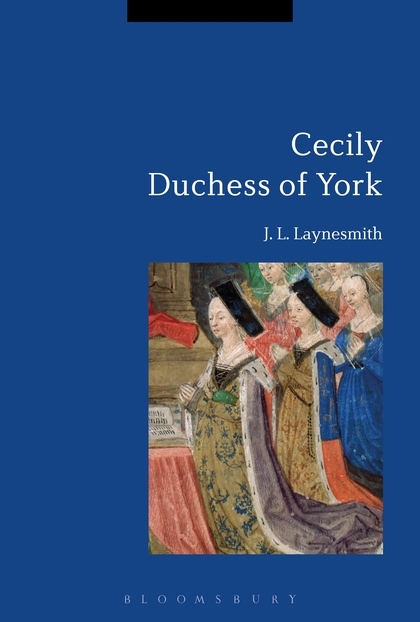 Go on, buy it, read it, and tell us what you think of it – and to make it easier – there is a discount… 35% discount off “Cecily Duchess of York” at http://www.bloomsbury.com on individual sales with the code GLR KR6 (that makes it £55.25, plus postage if overseas). We would also like to honor the runner up book from Penny NAsh on the Empress Adelheid and Countess Matilda (https://www.palgrave.com/gp/book/9781137590886) for its amazing scholarship on these two medieval women! And, if that’s not enough – also our early career and doctoral students in the field produce exceptional work: The 2018 RSJ-CCCU Prize for the best unpublished article by an ECR goes to Dr Alison Creber (KCL) for her article, “The Princely Woman and the Emperor: Imagery of Female Rule in Benzo of Alba’s Ad Heinricum IV”. – Keep a look out for this article in our December issue! Dr Catriona Murray is a historian of early modern British visual and material culture from the University of Edinburgh. 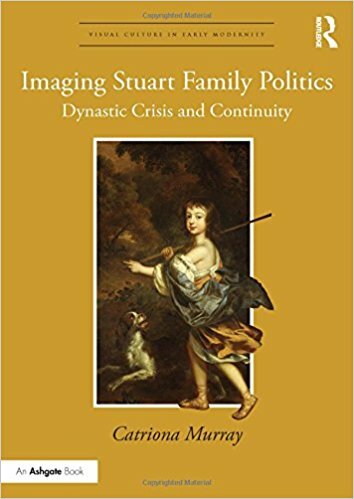 Her first monograph, Imaging Stuart Family Politics: Dynastic Crisis and Continuity, focuses on familial propaganda of the royal Stuarts. Her study has recently won the CCCU Book Prize from the Royal Studies Journal. The team from the Royal Studies Journal Blog got together with her to learn more about this award-winning research, and what is next for Catriona. Kristen, Cathleen, and Elena: First of all, congratulations to you! Your first monograph, and already you’re winning prizes for it! We do hope you celebrated accordingly! Could you please tell our readers a bit about the premises of this study on visual and material propaganda under the Stuarts? Catriona: Thank you! It really is an honour and I am very grateful to the book prize committee for their consideration. I think I can also confirm that at least one glass of fizz was consumed! Imaging Stuart Family Politics grew out of my doctoral research and actually began life in response to a single engraving, which I came across in the National Portrait Gallery’s Heinz Archive in 2008. Printed in 1703, it displays oval portraits of four Protestant Princes, Edward VI; Henry, Prince of Wales; Henry, Duke of Gloucester; and William, Duke of Gloucester, with a banner proclaiming ‘Wee [sic] Reign in Heaven’. I was intrigued by the idea that, despite their premature deaths, these figures continued to hold some allure decades and even centuries after their loss. As I probed further, I discovered a series of reproductive failures and untimely young deaths which blighted the Stuart line. Despite this, I also unearthed a wealth of visual material which indicated the importance attached to these lost dynastic hopes. I have always been interested in history’s ‘what ifs’ and the tensions between representation and reality so part of the drive behind the project was to retrieve the reputations of those forgotten Stuarts. Kristen, Cathleen, and Elena: As you said, these members of the royal Stuarts were mostly forgotten, and – honestly – we don’t know much about them either. Could you therefore please give some brief background for the uninitiated about Henry (son of James VI/I), Henry of Gloucester (son of Charles I), James of Cambridge (son of James II), and William of Gloucester (son of Princess, later Queen, Anne)? Did the representation of these later-born or early deceased children differ in any way to the heirs apparent? Catriona: Most importantly, all of the princes you mention were Protestant and the impacts of their deaths often became more pronounced as dissatisfaction with their successors developed. Henry, Duke of Gloucester, for example, died when he was twenty-one, just as the Stuarts were returning to power with the Restoration. Although, he was widely mourned at the time, it was not until several decades later, with increased concerns about the politics and religion of his brothers Charles II and James, Duke of York, that he was re-framed as a lost leader, a figure of vanished hope. Similarly, James, Duke of Cambridge, died when he was only three years old and yet some twenty years later his image still held resonance. Following the succession of his Catholic father, James II, and the failed rebellion of the Duke of Monmouth, Charles II’s illegitimate but Protestant son, a portrait of the long dead prince was commissioned by his sister, the future Mary II. Willem Wissing’s painting of the little Duke (the cover image of Catriona’s book) highlighted the extended absence of a Protestant male heir, presenting Mary as Britain’s next best hope. In life, representations of these princes were designed to encourage loyalty to the crown but, as time passed, they also assumed meanings beyond royal control. Their afterlives would prove controversial. Adriaen Hanneman, Henry, Duke of Gloucester (1653), oil on canvas, 104.8 x 87cm, Andrew W. Mellon Collection, National Gallery of Art, Washington D.C.
Kristen, Cathleen, and Elena: In the case of James, Duke of Cambridge, it was his sister Mary who used his image. Most of the other heirs were also quite young, and it seems striking that they are not portrayed in the family context. For example, it seems William of Gloucester was often represented without his mother, Princess Anne. During his life, was he “more important” than her? Catriona: It is a little more complicated than that. Actually, for reasons of gender, it was unusual for English male heirs to be portrayed with their mothers so the images of Anne and William together which do exist actually reflect their combined significance to the Stuart succession. Certainly, William’s birth was a great boost to Anne’s position after the Glorious Revolution and her motherhood became a crucial part of her public image even after her son’s death. In turn, Anne’s part in the Revolution and her self-proclaimed Englishness were important for William’s portrayal. Together they represented a bright future for the Protestant Stuart line. Kristen, Cathleen, and Elena: Following on from this, when it became apparent that the dynasty would pass on through the female line rather than the male line, the Stuart heirs like Mary of Orange or Sophia of Hanover were still pictured in their more traditional roles opposite men – as daughter, as consort or as mother. Are there any depictions of them in a more martial role or have they been associated with more manly and vigorous attributes? If not, why? Catriona: Not really. There is a lost portrait of the sixteen-year-old Mary as Minerva but, generally, her depiction conforms to tradition, presenting her with reference to the men in her life. Similarly, Sophia is portrayed as a matriarch, the founder of a long line of future kings. The representation of Protestant piety is also central to both women’s public images. Given their rather conventional lives as royal women, this is not really surprising. Both Mary and Sophia were political pawns in the international marriage market and, upon their entry into wedlock, were supposed to secure the line and produce offspring. As heir to the throne, their representations continued to reflect those gendered expectations. This was an age when artists and patrons were predominantly male. Even images of Elizabeth I as heir subscribed to the conventions of female portraiture. Women’s agency and its portrayal had to be negotiated carefully. Kristen, Cathleen, and Elena: In your book you are saying that “the fine arts have often been viewed in isolation – both from popular and material culture and from contemporary political, religious and intellectual developments.” Yet, they are so interconnected. What do you think is the reason behind that separation? Catriona: Firstly, study of the art of seventeenth-century Britain remains an emerging field and some of its most important scholarly contributions are now decades old. As a result, reassessments of the material and its literature have stalled. A traditional focus on connoisseurship, form and technique has prevailed until recently. Indeed, it has taken historians, such as Malcolm Smuts and Kevin Sharpe, to forge ahead and re-present the art history of early modern Britain as an interconnected cultural history. We need to value the – sometimes idiosyncratic – art of the seventeenth century as much for the stories it can tell as for its visual qualities. Steadily, historians and art historians are embracing this approach and producing works which demonstrate the pervasiveness of the visual as a complex social and political language during this time. Kristen, Cathleen, and Elena: So, after already winning a prize for your very first monograph – what can we expect next from you? Are you further working in the interdisciplinary field connecting art history and history? Catriona: I am just beginning to get my teeth into a new monograph project which will explore the origins and development of public sculpture as an art of political communication in early modern Britain. Under the Stuart dynasty, monuments played a pivotal role in the negotiation of authority. The imposition of a royal sculptural presence, in strategically-selected urban locations, articulated the reach of royal dominion. In turn, though, sculptures became physical sites for public interventions, which both supported and contested Stuart government. Covering portrait busts, public statuary and tomb monuments, as well as temporary festival sculpture and ceremonial effigies, I hope this project will expose the complex processes through which the Stuart monumental image was both fashioned and dismantled, while exploring visual languages of power which are still contested today. Kristen, Cathleen, and Elena: We wish you the best for this new, exciting research project. Thank you for taking the time to show us this fascinating aspect of the Stuarts! The first winner of the Royal Studies Journal Article Prize is Rocío Martínez López, a doctoral candidate at the Universidad Nacional de Educación a Distancia (Madrid, Spain). She is also involved in the organisation of the next Kings & Queens conference which will take place in Madrid in September 2017. Rocío has translated her article with the invaluable help of Ellie Woodacre and Jitske Jasperseand. It appears in the current issue of the Royal Studies Journal here. I caught up with her to ask a few more questions about her article, and her research in general. Cathleen: Hi Rocío! Thanks for doing this interview. You recently won the Royal Studies Journal Article Prize, sponsored by Canterbury Christ Church University (CCCU) for your article ‘La infanta se ha de casar con quien facilite la paz o disponga los medios para la guerra‘. Las negociaciones para la realización del matrimonio entre la infanta María Teresa y Leopoldo I (1654-1657) in the journal Revista de Historia Moderna 33 (2015). Congratulations! First of all, could you tell us a bit about this article? What is it about? Rocío: Hi, Cathleen! 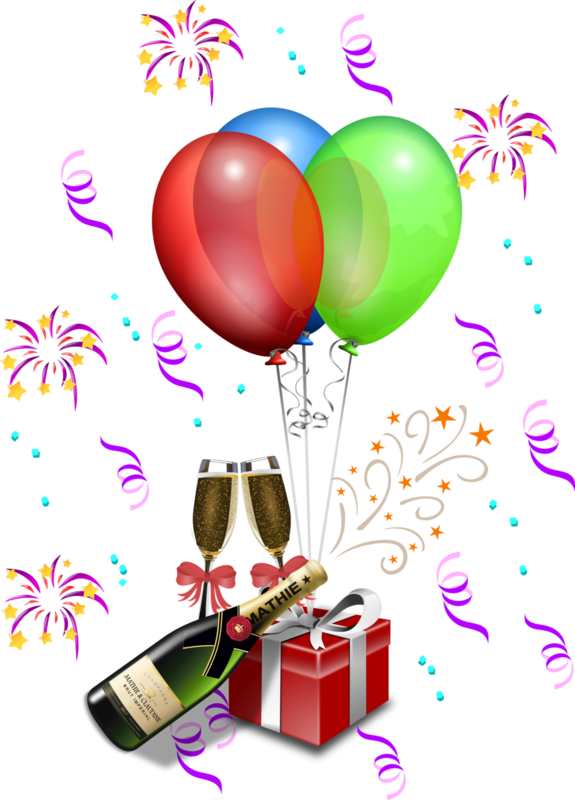 Thanks for your congratulations! I feel really honored and I want to thank the Royal Studies Journal, the Canterbury Christ Church University and the ECR and Young Researchers’ Article Prize Committee for it. Well, my article focuses on the analysis of the marriage negotiations between Felipe IV of Spain and the emperors Ferdinand III and Leopold to arrange the marriage between the King of Spain’s prospective heiress, infanta María Teresa, and the heir of the Imperial branch of the Habsburgs. These negotiations, which lasted more than a decade, can help us understand the complex relationship maintained between both branches of the House of Habsburg after the peace of Westphalia, in a moment in which the problem of the Spanish Succession was of capital importance in Europe. After the death of Prince Baltasar Carlos, Felipe IV’s only son and heir, in 1646, the question of the marriage of his only surviving daughter and heiress became a crucial point in the European diplomacy of the moment. María Teresa was the direct successor of her father for more than ten years in an especially difficult moment for a Spanish monarchy immersed in a grueling war against France. Wanting to assure the inheritance of the Spanish monarchy for his line, in case that Felipe IV would die without a male heir, Emperor Ferdinand III tried to arrange the Infanta’s marriage with his heir, first with King Ferdinand IV of Hungary and, after his death, with Leopold I. But these ultimately failed negotiations were anything but easy. Felipe IV wanted to assure the future of his daughter and his monarchy, arranging a marriage for her that would help him to put an end to the war with France and, also, that would follow his interests regarding a possible goverment of the Spanish monarchy. 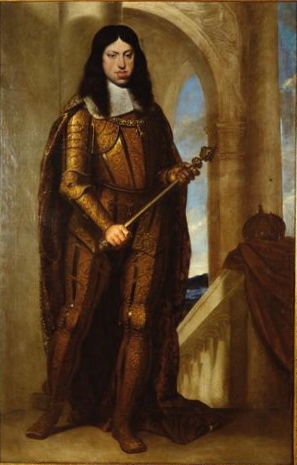 For his part, Ferdinand III wanted for this marriage to follow his own dispositions and refused to let his son and heir renounce to the Crown of the Empire to marry the Infanta and to live in Madrid, even when Felipe IV ended up offering the hand of his daughter in marriage to Leopold. Ferdinand III died without resolving this issue and Leopold I showed very soon his good disposition to travel to Madrid and renounce the possibility of being elected Emperor, even when he realized that he could end up with nothing if Felipe IV had a male child. They were negotiating this arrangement when Mariana of Austria, Felipe IV’s second wife, gave birth to a son, Prince Felipe Próspero. From that point onwards, María Teresa wasn’t the heiress of the Spanish monarchy anymore and her father had more freedom than before to arrange her marriage to his liking. This birth changed the rules of the game and Leopold I ended up losing the bride for whom he was ready to renounce the Crown of the Empire without any guarantees of getting the Spanish monarchy in return. It is a very interesting episode and shows us how the international politics could change drastically in connection with the dynastic problems and the crisis of sucession in Early Modern Europe. Cathleen: This question of the Spanish succession as well as the diplomatic negotiations regarding the marriage of María Teresa, daughter and heiress of Felipe IV, dominated the second half of the 17th century between the Thirty-Years-War and later the wars of María Teresa’s eventual husband, Louis XIV. How do these failed marriage negotiations relate to the War of the Spanish Succession a few decades later? Rocío: This marriage is closely related to the War of the Spanish Succession. We need to take into account that the problem of the Spanish Succession isn’t a circumstance that emerged in the last years of the seventeenth century, but an issue that had a great importance in the European policy from 1646 until the outbreak of the War of the Spanish Succession. In the question of the Spanish succession, Felipe IV’s daughters and Carlos II’s sisters, María Teresa and Margarita, had a crucial importance, as the most immediate relatives of the childless King. The marriage of María Teresa with Louis XIV was preceded by a solemn renunciation, made by the Infanta, of all her rights to the Spanish Monarchy for herself and her descendants, but Louis XIV began to fight against its legality soon after the marriage took place. This renunciation made her little sister Margarita the legitimate heiress of Carlos II, following said renunciation and Felipe IV’s last will. Margarita ended up getting married to her sister‘s old suitor, Leopold I, and her line would be considered as the legitimate heirs of the Spanish monarchy until its extinction in 1699, despite France’s claims. Louis XIV‘s pressure regarding the Spanish sucession came from his marriage to María Teresa and the fact she was Felipe IV’s eldest daughter. If she had married Leopold I, as it was originally planned, and had had surviving issue, France would not have had the same claims to the Spanish succession and this process would have been very different. Felipe IV didn’t want his inheritance to leave the House of Austria. Both Felipe IV and Ferdinand III were very aware of the problems that could befall their dynasty if the inheritance of the Spanish monarchy were to end up in the hands of France and that belief was very present in this marriage negotiation. On one point, Felipe IV’s counsellors advised their King that he should marry María Teresa with the Emperor’s heir because they would need his help in case France claimed any territories of the Spanish monarchy in any instance. Felipe IV was aware that the marriage between María Teresa and Louis XIV was the most convenient possibility to end the war, but he couldn’t allow it while his daughter was his only heiress. It was the birth of two possible male heirs that made him feel secure enough about the future of his own line to choose another destiny for María Teresa. But its connection with the War of the Spanish Succession is very clear and can show us how the Spanish’s succession crisis influenced the European policy decades before its outbreak. Cathleen: So, just as a thought experiment: What if this marriage between María Teresa and Leopold I, between the two branches of the Habsburg dynasty, came to be? How would that have changed the course of events in the late 17th and early 18th century? Rocío: The easy answer to that question would be that the War of the Spanish Succession would never have happened. None of the infantas who married into the Imperial branch of the Habsburgs renounced to their rights of succession to the Spanish throne and it wasn’t expected for Maria Teresa to do so if she married Leopold, as she had to do when she married Louis XIV. The possible rights to the succession of the Spanish throne that Louis XIV claimed on María Teresa’s behalf since 1660 onwards were linked to the fact that his wife was the eldest daughter of Felipe IV and eldest sister of Carlos II. Without said marriage, he wouldn’t have any claims to the Spanish territories with three descendants of Felipe IV (Carlos II, María Teresa, and Margarita) alive and with the possibility of having their own descendants. Other international problems linked to the succession crisis, like the War of Devolution (1667-1668) would have had a very different nature as well. Also, the marriage of Maria Teresa’s younger sister, Margarita, who eventually married Leopold years later, would have to be with another person, something that would have altered the rules of the game once more. As you can see, the history of Europe during the second half of the seventeenth century would have been very different. But I also have to add that these changes would have taken place only if María Teresa and Leopold, as well as Margarita and the one who would have been her husband, had surviving issue. Without them or their descendants, the succession would have been disputed between the descendants of the infanta Ana, eldest daughter of Felipe III of Spain, married to Louis XIII and mother of Louis XIV, who renounced her rights to the Spanish throne before her marriage (as María Teresa had to do) and those of the empress Maria Anna, youngest daughter of Felipe III, wife of emperor Ferdinand III and Leopold I’s mother. So if they would have died without any descendants, we would have been back to square one. And the chances of that happening weren’t as slim as one could think. María Teresa had six children with Louis XIV, of which only one, the Dauphin Louis, survived into adulthood and Margarita had four children with Leopold I, of which only the archduchess Maria Antonia survived and her line became extinct before the end of the century. But, even taking this into account, we can assume that the history of Europe from 1660 onwards would have been very different if the marriage between María Teresa and Leopold would have taken place as expected and, with descendants of this marriage, the War of the Spanish Succession probably would have never taken place. Cathleen: The level of interest of Leopold I in this marriage is very surprising – even against the wishes of his father, he pressed for the negotiations and was prepared to relinquish the election to be emperor of the Holy Roman Empire. 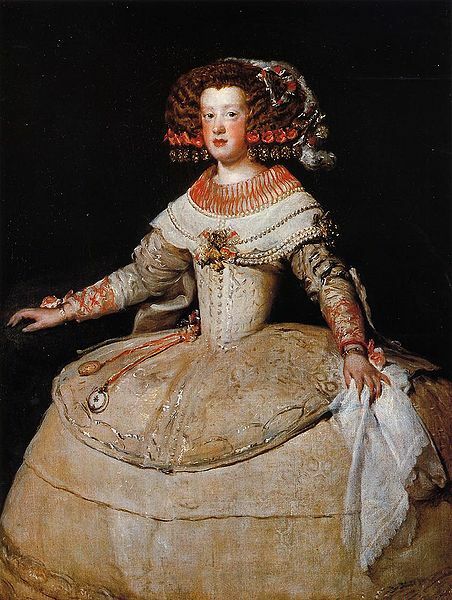 Why was he so keen on marrying the Spanish infanta? Rocío: When we talk about this, we must remember that, at the time, Felipe IV’s inheritance was composed of the most vast and extensive monarchy in the world. It has its problems, without any doubt, but the power it entailed was far greater than the one Leopold could efectively hold as an emperor, especially after the peace of Westphalia and the negotiations surrounding it imposed important limitations on the powers of the imperial ruler. I think that the prospect of being the king of the Spanish monarchy was too tempting for Leopold to refuse, especially when almost everybody thought that the possibility of Felipe IV having a surviving male heir were slim and he was sure that he could mantain control of the patrimonial lands of the Habsburgs in Central Europe, as well as of Hungary and Bohemia. Ferdinand III wanted for his heir to remain linked to his patrimonial lands and to the crown of the Empire and was very aware that his son could end up with very little if María Teresa wasn’t finally the heiress of the Spanish monarchy. In fact, if Felipe IV hadn’t tried to convince Leopold to present himself as a candidate for the Imperial Crown and had come to Spain when he wanted, he would have ended up only with his patrimonial lands after his prospective wife was relegated to a secondary place in the line of succession. Leopold was prepared to take the risk to have the oportunity of becoming one of the most powerful monarchs of the time through his wife, even if that meant giving up the difficult crown of the Empire, for whose government he had to rely heavily on the difficult Imperial princes. From his point of view, it was worth the risk and he was ready to take it at that moment, but it wasn’t mean to be. Cathleen: What are you working on right now? Rocío: I am currently working on my dissertation. It is focused precisely on the problem of Carlos II of Spain’s succession during his reign and how it influenced its political relationship with the Empire and Bavaria, using as a common point the fact that Infanta Margarita, archduchess María Antonia of Austria and Prince Joseph Ferdinand of Bavaria were considered as the rightful heirs of the Spanish Monarchy by Madrid’s government. I had the opportunity of consulting documents of several archives of Spain and Vienna and I have been awarded a grant to conduct further research in Munich in autumn, so I am very happy with the results and I hope for my dissertation to be completed in winter 2017. Also, I am preparing two articles, one focused on the negotations for the marriage of Leopold I and Margarita of Austria after María Teresa’s marriage and the other presents an analysis of the rights of succession of the infantas and archduchesses of the House of Habsburg during the Early Modern period. And, finally, I am also working on the organization of the next King&Queens conference, who will take place in my hometown, Madrid, where I hope to see you all! Cathleen: Good luck with your research and your PhD and thanks so much for doing this interview! Hope as well to see you all at the next Kings&Queens Conference in Madrid which we will later have more about! The winner of the first CCCU RSJ Book Prize, Dr. Carolyn Harris, is a historian, author and royal commentator (and isn’t this a great job title) from Toronto, Canada. She completed her PhD in spring 2012 at Queen’s University (Kingston, Canada), and has been very busy since then. Her prize-winning book Queenship and Revolution in Early Modern Europe: Henrietta Maria and Marie Antoinette (Palgrave Macmillan: Queenship and Power Series) is already her second published monograph, the first one being Magna Carta and Its Gifts to Canada: Democracy, Law and Human Rights (Dundurn Press 2015), and the third is scheduled for 2017: Raising Royalty: 1000 Years of Royal Parenting (Dundurn Press). Besides obviously spending her days researching and writing, she also teaches at the University of Toronto School of Continuing Studies, and is a guest lecturer for museums, libraries, universities, and educational organisations. Occasionally, she even gives lectures at sea for cruise ship enrichment programs. Find her also on Twitter @royalhistorian. We got together with Carolyn to ask more about her research. Cathleen: Hi Carolyn! Thanks for doing this interview! You recently won the Royal Studies Journal Book Prize, sponsored by Canterbury Christ Church University (CCCU) for your monograph Queenship and Revolution in Early Modern Europe: Henrietta Maria and Marie Antoinette. Congratulations! Could you first tell us a bit more about this book, especially for our readers who haven’t yet a chance to take a look inside? Carolyn: Queenship and Revolution in Early Modern Europe analyzes Queen Henrietta Maria, queen to King Charles I and Queen Marie Antoinette, queen to King Louis XVI in their roles as wives, mothers and heads of royal households during the years preceding the English Civil Wars and French Revolution respectively. I compare the two queens and the political cultures of the seventeenth and eighteenth centuries. The book is structured thematically, examining the contrast between how each queen viewed her domestic role and the expectations of her husband’s subjects. The final chapter compares the impeachment of Henrietta Maria by the House of Commons in 1643 with the Trial of Marie Antoinette by the Revolutionary Tribunal in 1793 then the book concludes with the lasting impact of the debates concerning each queen’s place in her family during periods of political turmoil. Cathleen: While the comparison between Charles I and Louis XVI has often been made, their wives were usually a bit marginalized in the political history of the English and the French Revolution. How did you develop an interest in these two queens? Carolyn: I have always been interested in the position of royal women in court culture and how these figures have been perceived by the public. My article for Canadian Slavonic Papers, The Succession Prospects of Grand Duchess Olga, examines the public role of Emperor Nicholas II’s daughters during the years prior to the Russian Revolutions of 1917. I also wrote a chapter about how Queen Victoria’s fourth daughter Princess Louise was perceived during her years as vice regal consort of Canada in the book Canada and the Crown: Essays on Constitutional Monarchy. Examining Henrietta Maria and Marie Antoinette, I found the parallels between their experiences fascinating. They were both youngest daughters in large royal families where their mother’s wielded political power. As queens consort, they were judged as wives, mothers and mistresses of royal households and scrutinized as foreign influences over their respective ruling husbands. Henrietta Maria was impeached by the House of Commons during the English Civil Wars and Marie Antoinette was executed during the French Revolution after being tried and sentenced by the Revolutionary Tribunal. I wanted to explore the parallels between these two queens and how they conducted their lives in the public eye during periods when the role of women in society was debated during the seventeenth and eighteenth centuries. Cathleen: You certainly emphasize the role of public opinion in the treatment of these queens. Could you please expand a bit more on this? Carolyn: Criticism of the queen was a method of critiquing the king’s policies without direct criticism the king himself. Both Henrietta Maria and Marie Antoinette were women and foreigners and there was enormous popular anxiety about the potential for them to exert political influence. Critics of the queen could present themselves as loyal subjects who wanted to neutralize foreign influences. There was a long tradition in both England and France of critiquing advisors to the monarch and criticism of Henrietta Maria and Marie Antoinette became part of this tradition. Critiquing the queen as a wife and mother was also a means for people of diverse social backgrounds including women to engage with the political process. High politics was the preserve of the elites but people of all social backgrounds could discuss the queen through their own experiences and observations of marriage and motherhood. 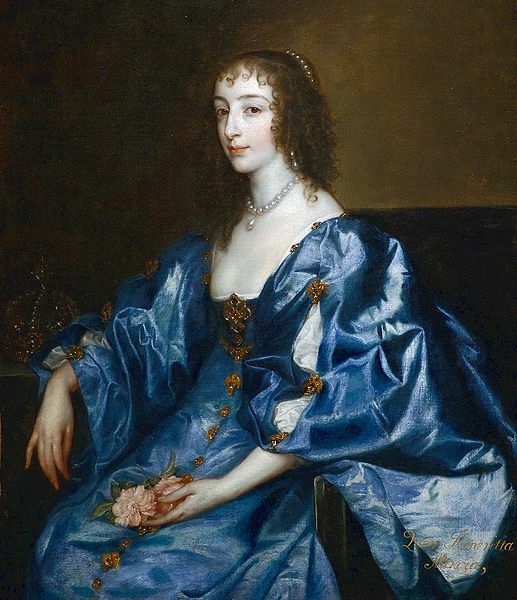 Henrietta Maria’s critics included female writers who questioned the sincerity of harmonious imagery of the queen’s marriage and women arrested for seditious speech who spoke aloud of how they influence the king if they were the queen. Marie Antoinette was a patron of female writers and artists but women were divided in their opinions of the queen as a wife and mother. 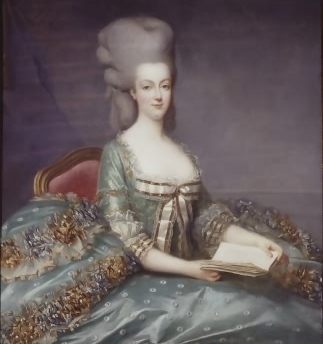 During the childless early years of her marriage, Marie Antoinette was criticized by Parisian market women because she had not given France a Dauphin. During the French Revolution, Olympe de Gouges dedicated the Declaration of the Rights of Woman and the Female Citizen to the queen but the historian Louise de Karalio placed Marie Antoinette within a centuries long tradition of supposed crimes committed by Queens of France. Cathleen: After having read your book, it seems quite clear that between the times of Henrietta Maria (mid-seventeenth century) and of Marie Antoinette (end of eighteenth-century) not only the role of women in society was debated, but also quite a few changes happened concerning the role of women in their families and marriages as well as a different political culture in regards to (informal) counsel at court. How does this relate to these two queens? Carolyn: Both Henrietta Maria and Marie Antoinette became wives and mothers in the public eye during times periods of ideological debate concerning the role of women in their families. During Henrietta Maria’s lifetime, there was enormous concern among Protestants in England and Scotland regarding recusant wives and mothers who might influence their families toward Roman Catholicism. Henrietta Maria was a Roman Catholic princess married to a Protestant king and the terms of her marriage contract gave her both her religious freedom and authority over her children. Henrietta Maria therefore became the highest profile example of this phenomenon of recusant wives and mothers. In late eighteenth century France, Enlightenment scholars debated the role of women within their families, especially whether the position of women arose from laws created by man or the conditions found in nature. Jean-Jacques Rousseau argued that women were naturally inclined to the domestic sphere while the public sphere was a male realm. Marie Antoinette adopted certain elements of the late eighteenth century conception of natural childrearing including breast feeding and allowing her young children freedom of movement but she also expected to exert political influence in the public sphere. Marie Antoinette therefore became part of wider French debates about the proper role for women in their families and society. Cathleen: This interest in early modern English and French queens seems quite different from your first book on the Magna Carta, especially its reception in Canada. Could you also tell a bit more about this? Carolyn: Queenship and Revolution in Early Modern Europe: Henrietta Maria and Marie Antoinette arose from my PhD research at Queen’s University. The manuscript was under development when I began working with Magna Carta Canada, writing historical articles about King John and Magna Carta for the exhibition that toured in Canada for the 800th anniversary of Magna Carta in 2015. In 2014, the co-chairs of Magna Carta Canada invited me to write the companion book for the Magna Carta Canada exhibition, Magna Carta and Its Gifts to Canada. 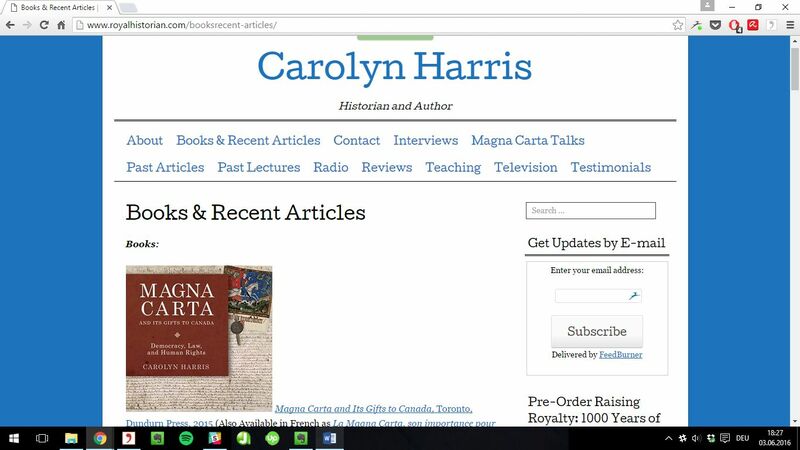 The two book projects came together around the same time: Magna Carta and Its Gifts to Canada was published by Dundurn Press in May 2015 and Queenship and Revolution in Early Modern Europe was published by Palgrave Macmillan in November 2015. There is common ground between the two books: the legacy of Magna Carta informed both the English Civil Wars and the French Revolution. Cathleen: That is true – Magna Carta had a renaissance in seventeenth-century England as well as inspiring revolutionaries from all times. Besides writing prize-winning books, you are also quite active giving lectures and interviews as well as teaching and writing – honestly: how do you manage all this? What got you started? Carolyn: The past five years have been extremely busy. During my PhD at Queen’s University, one of my professors recommended me to the media for interviews about royal history during weeks prior to the wedding of Prince William to Catherine Middleton in 2011. I became the university’s royal expert, undertaking a diverse range of media work in print, online, radio and TV. In 2012, the year I completed my PhD and began teaching at the University of Toronto, School of Continuing Studies, I established my website royalhistorian.com and twitter account @royalhistorian and continued to expand my media work. I am involved in a variety of projects in addition to teaching and providing royal history commentary for the media. I write regularly for the Historica Canada Canadian Encyclopedia, fact check documentaries and consult on museum exhibitions. I have guest lectured about history and royalty in a variety of settings including universities, libraries, retirement residences and cruise ships! Cathleen: This sounds amazing! And you still find time for your own research! What are you working on right now? Carolyn: I’m currently working on my third book, Raising Royalty: 1000 Years of Royal Parenting, which will be published by Dundurn Press in 2017. The book will profile 25 sets of royal parents and the challenges they faced from fending off Viking attacks to fending off the paparazzi! I am also working on a scholarly article about Queen Henrietta Maria’s reputation during her widowhood. She continued to be an active and controversial political figure for twenty years after Charles I’s death but this period in her life has received comparatively little attention. Cathleen: That is true. Much like for other queen consorts, there also seems a lot to learn about Henrietta Maria. Best luck for your new projects and thanks so much for doing this interview! For more see our upcoming issue where you can read about why Carolyn’s book was selected and read Courtney Herber’s review of her prize winning book.